The house at 241 North Main Street in Suffield, around 1935-1942. Image courtesy of the Connecticut State Library. This house was built around 1762 for Josiah King, Jr. and his wife, Sarah Kellogg. The couple were married that year, and they went on to raise three children here. In 1775, in response to the battles of Lexington and Concord, Josiah marched toward Boston with other area militiamen, serving for nine days until the initial crisis had passed. He would later see additional service in the war, and in 1778 he was commissioned as a captain in Connecticut’s First Regiment. Aside from his military service, Josiah was a farmer, and he lived here in Suffield until his death in 1815, at the age of 84. Although the house dates back to the mid-1700s, it appears to have been altered sometime later, probably after Josiah King’s death. Many of its prominent features, such as the wide entablature above the second floor, the pilasters in the corners, and the fan window on the left side, did not become commonplace until the Greek Revival era of the early 19th century, so these alterations probably date back to that time period. When the first photo was taken around the 1930s, the house was listed as being in “very good” condition, and not much has changed in the 80 years since then. 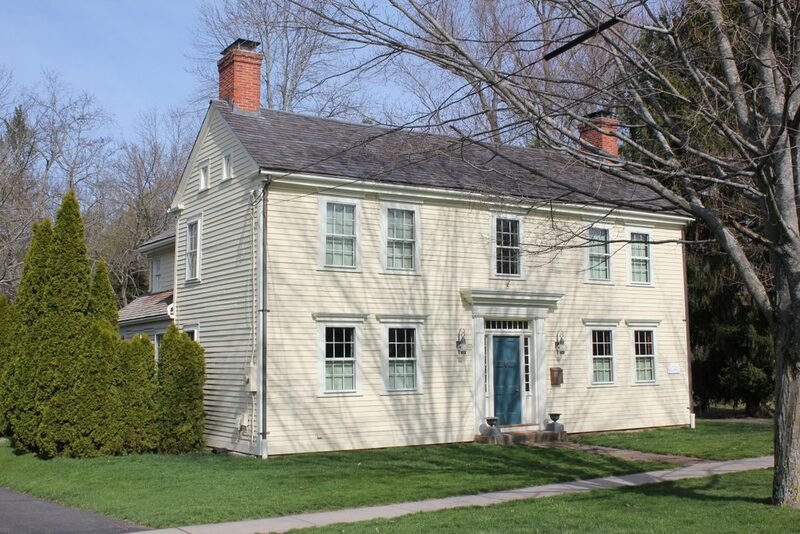 It remains well-preserved, and is one of the many historic 18th century homes in the center of Suffield. 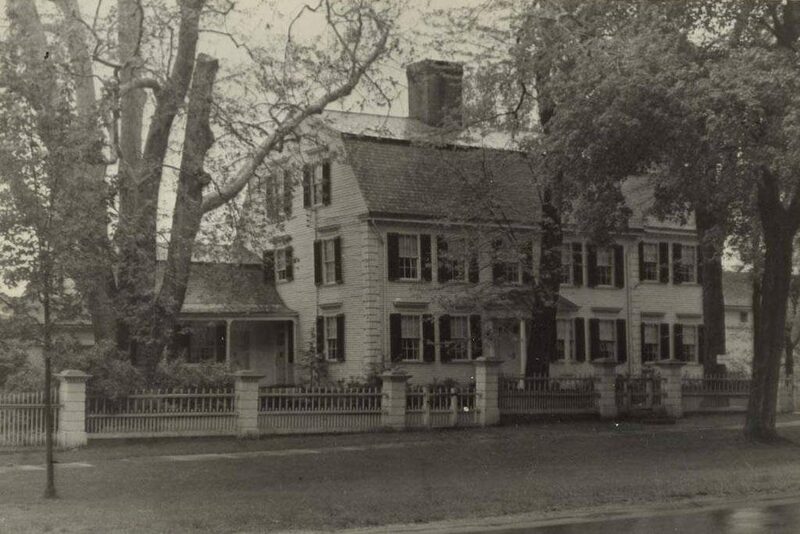 The Phelps-Hatheway House on South Main Street in Suffield, around 1935-1942. Image courtesy of the Connecticut State Library. This elegant Georgian-style home is a prominent architectural landmark in the Connecticut River Valley, and is one of the finest 18th century homes in the entire region. 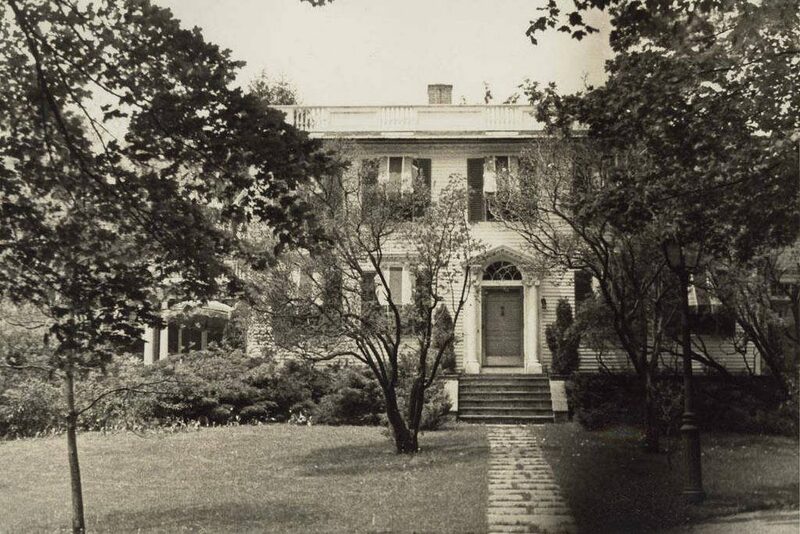 As mentioned in an earlier post, it was built sometime between the 1730s and 1761 for Abraham Burbank, and the house was later inherited by his son Shem. At the time, the house was much smaller, consisting of just the central portion. It had a gabled roof, and lacked the ornamentation that was later added. Shem was a merchant, as well as a captain in the state militia prior to the American Revolution. However, like many other wealthy merchants in the area, he was also a Tory, and sided with the British during the war. As a result, his business suffered, and in 1788 he had to sell the house. The next owner of the house was Oliver Phelps, who, like Burbank, had been a merchant. However, unlike Burbank, he had been on the winning side of the American Revolution, serving as a deputy commissary for the Continental Army. He was originally from Granville, Massachusetts, and served in both houses of the Massachusetts legislature. He was also a delegate to the state’s constitutional convention in 1779-1780, and served on the Governor’s Council in 1786. At this point he was a wealthy man, and in 1788 he formed a partnership with Nathaniel Gorham, who had been one of the delegates to the US Constitutional Convention the year before. Together, they purchased six million acres of land in western New York for one million dollars, and that same year Phelps purchased this house from Shem Burbank. Around 1794 set about expanding the house with a new wing on the right side, as well as adding ornamentation to the exterior. This brought the house up to architectural tastes of the late 18th century, and it also reflected his considerable wealth and social standing. Some of the remodeling was done by a young local architect, Asher Benjamin. About 21 years old at the time, he would go on to become one of the nation’s leading architects, and this house is his earliest known work. Phelps also had the interior decorated lavishly, including with imported French wallpaper that still covers the walls of the house today. During this time, Phelps also continued his land speculation, purchasing vast tracts of land in present-day Ohio, Georgia, West Virginia, and northern Maine. By 1800, he was, according to some sources, the largest private landowner in the country, but this ultimately led to his downfall when land values dropped. Deeply in debt, he sold his house in 1802 and moved to Canandaigua, New York, which had been part of his initial land purchase in 1788. He served a term in Congress from 1803 to 1805, but his financial troubles continued, and he died in debtor’s prison in 1809. 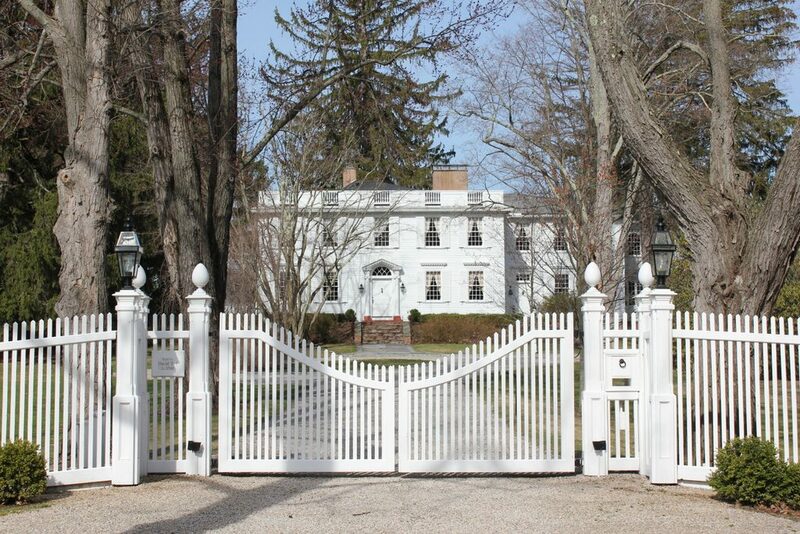 Apparently undeterred by the financial ruin of its two previous owners, Asahel Hatheway purchased the house from Phelps in 1802. He had grown up at his parents’ house just a little south of here, and studied theology at Yale. After graduation, he briefly worked as a pastor, but then returned to Suffield, where he became a farmer and a merchant, along with serving as a church deacon and a justice of the peace. He married his wife Anna in 1778, and they had six children together. Anna died in 1807, only about five years after moving into this house, but Asahel continued living here until his death in 1828, at the age of 89. Louise was the last living descendant of Asahel Hatheway, Sr., and after her death many of the family heirlooms were donated to the Wadsworth Atheneum in Hartford. 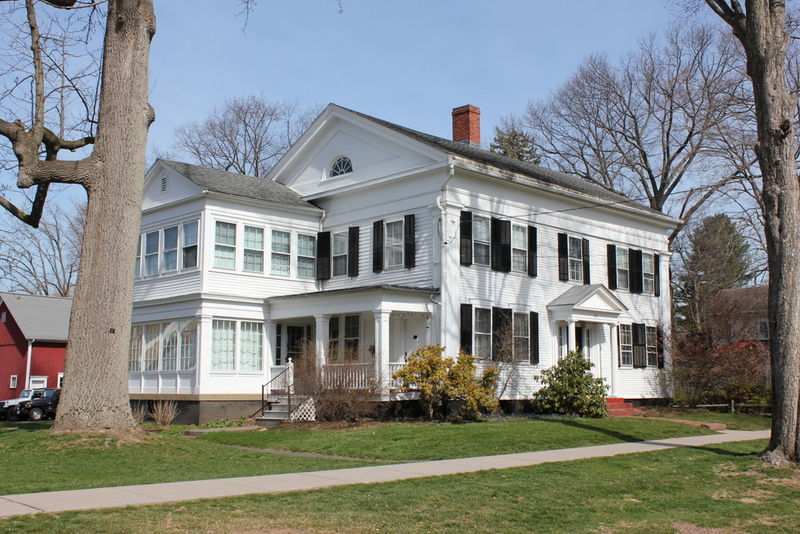 The house is now owned by Connecticut Landmarks, a preservation organization that maintains several historic houses in the state. Both the exterior and interior have been remarkably well-preserved, and the house is open to the public for tours. Even older than the house itself, though, is the massive sycamore tree on the left side of both photos. It is approximately 300 years old, predating the house by several decades, and aside from the loss of a large limb it has not changed much in the 80 years since the first photo was taken. 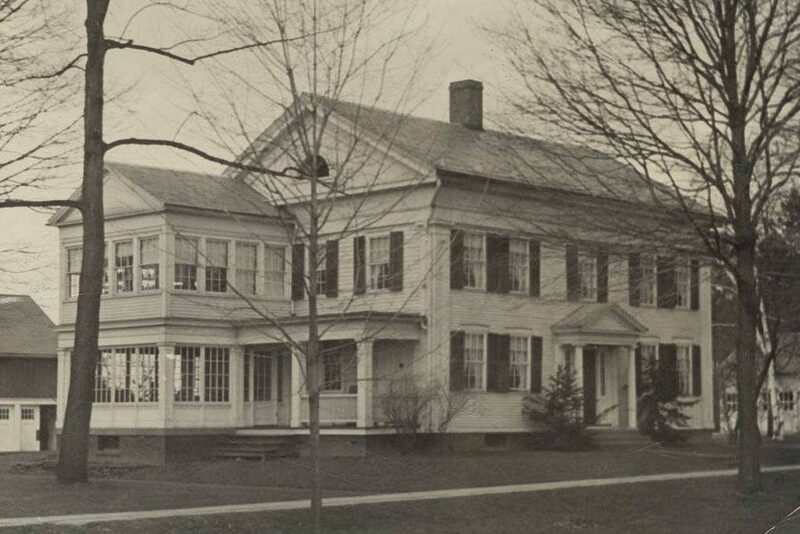 The house at 155 South Main Street in Suffield, around 1935-1942. Image courtesy of the Connecticut State Library. This house was built in 1795 for Timothy Phelps and his wife Elizabeth. At the time, they had two young sons, Thaddeus and James, and they would later have a daughter, also named Elizabeth. The overall appearance of the house is similar to the traditional New England Colonial-style home, with a gabled roof and a symmetrical front facade, with four windows on the first floor and five on the second floor. However, the house is more ornate than the earlier Colonial homes, with classically-inspired elements such as the Palladian window above the door, cornices over the windows, and pilasters on the corners of the house. Timothy Phelps died in 1836 at the age of 75, and Elizabeth died nine years later. Since then, the house has undergone some changes, including additions on the back. Probably the most noticeable change, though, is the metal roof, which was installed sometime before the first photo was taken. Overall, though, the house has retained its Federal-style architectural details, and it is one of many elegant 18th century homes in the center of Suffield. 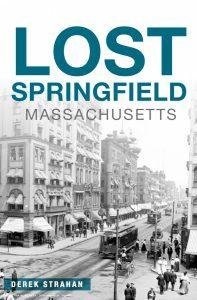 Along with the other surrounding homes, it is now part of the Suffield Historic District on the National Register of Historic Places. The house at 161 South Main Street in Suffield, around 1935-1942. Image courtesy of the Connecticut State Library. It seems unclear how long Kent lived in this house, because he also lived in a smaller home nearby at 221 South Main Street before his death in 1813. Since then, his house here has remained well-preserved, and it is one of the many 18th century homes that line North and South Main Street in Suffield. 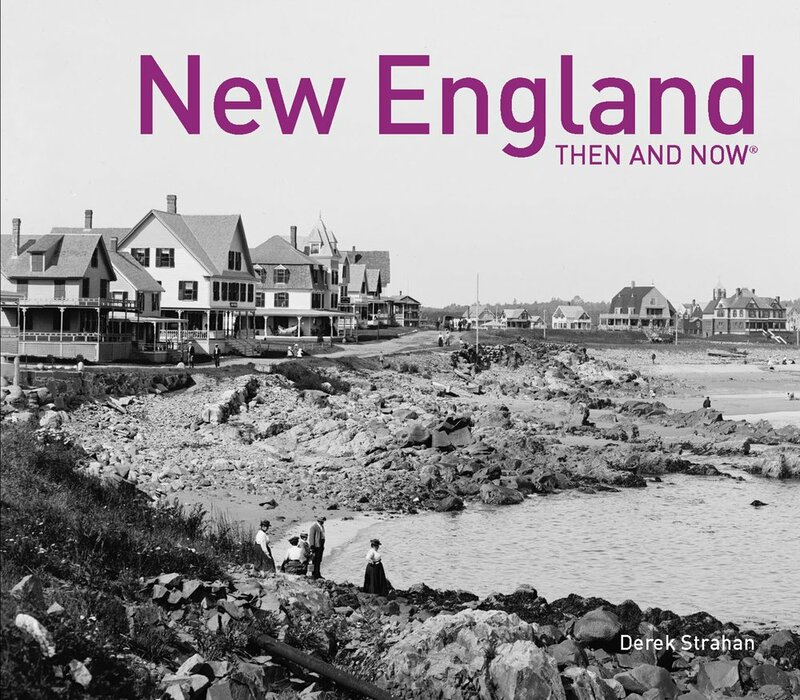 When the first photo was taken, it was listed as only being in “fair” condition, but it has since been restored, and is now part of the Suffield Historic District on the National Register of Historic Places. The house at 221 South Main Street in Suffield, around 1935-1942. Image courtesy of the Connecticut State Library. The National Register of Historic Places form for the Suffield Historic District describes this house as “odd,” and it certainly is unique among the other houses in the area. 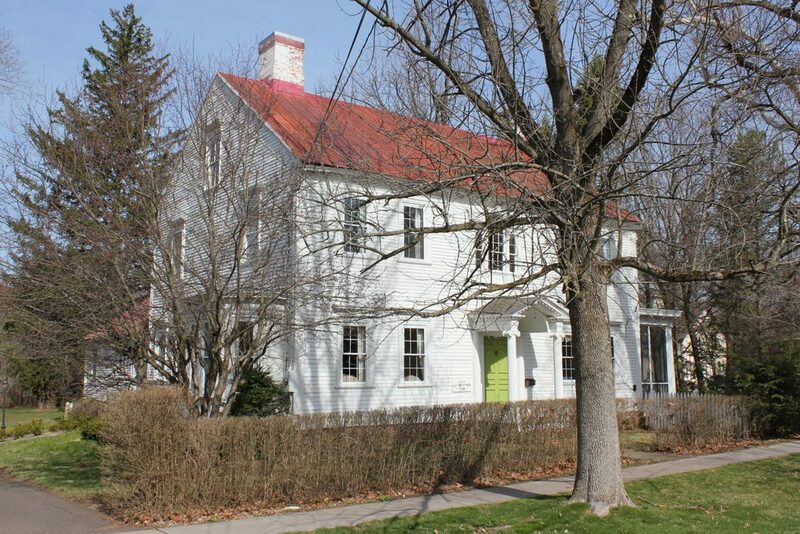 It was built sometime around 1800 and was, at one point, the home of Elihu Kent, Jr., who also lived in a nearby house at 161 South Main Street. A veteran of the American Revolution, he had been captured during the Battle of Long Island, and spent time in a British prison in New York. Following the war, he lived in Suffield until his death in 1813. 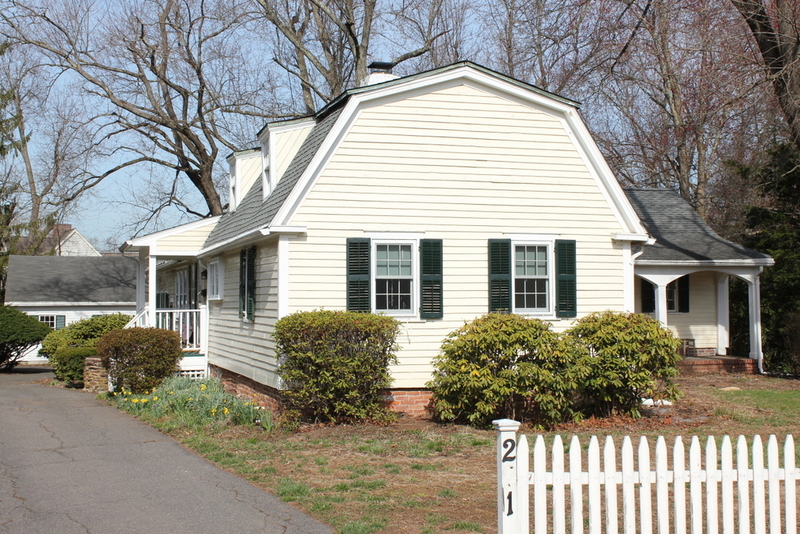 The unusual appearance of this house is likely from many years of additions and alterations. 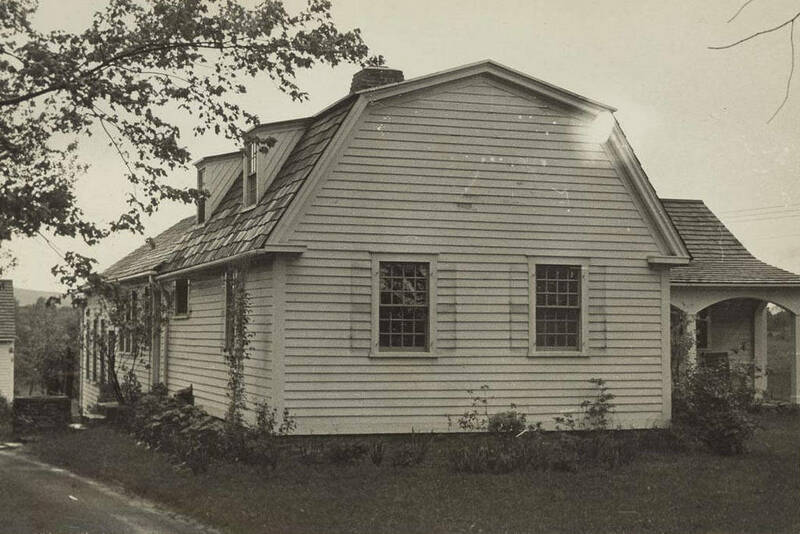 When the first photo was taken, the photographer noted that “modern changes have destroyed all external evidence of early house,” with “modern additions on rear and north.” The oldest part of the house appears to be the gambrel-roofed section in the foreground, although the exact date of construction, and the names of subsequent owners, seems unclear. 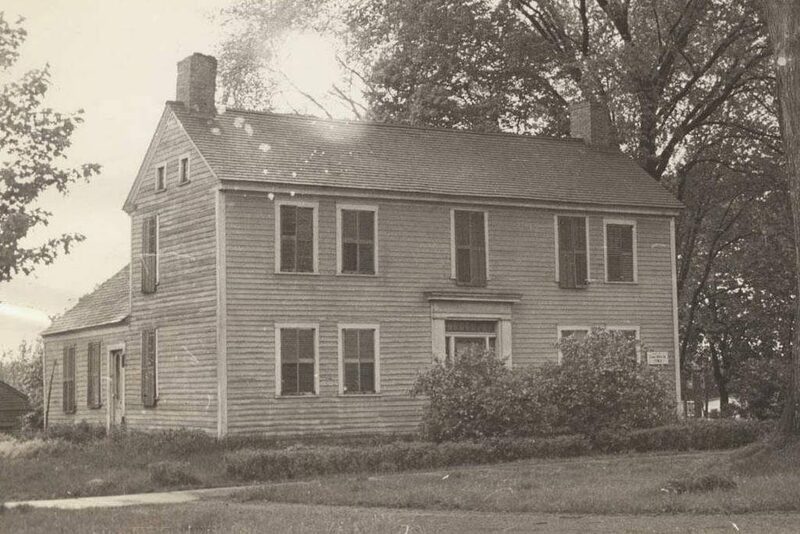 Not much has changed since the first photo was taken, though, and despite he changes it still stands as one of the many historic homes in the center of Suffield. 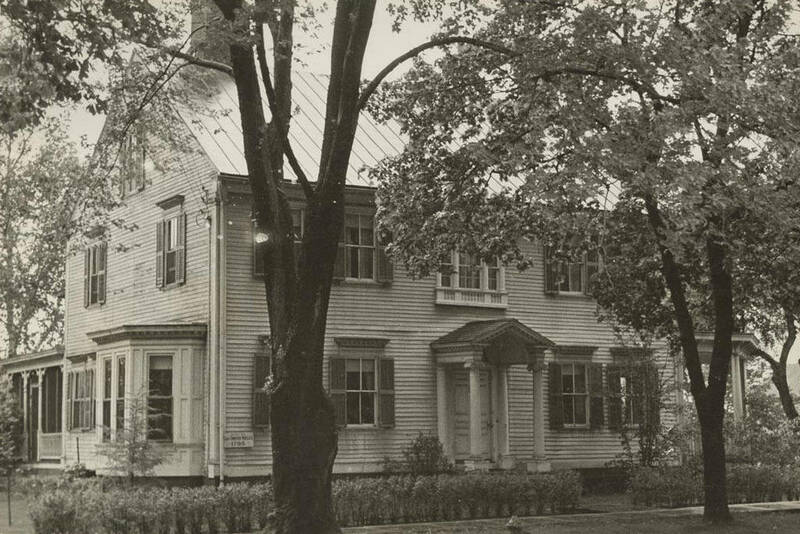 The house at 285 South Main Street in Suffield, around 1935-1942. Image courtesy of the Connecticut State Library. The exterior of this house has undergone significant changes since it was built, but it dates back to sometime between 1773 and 1795. 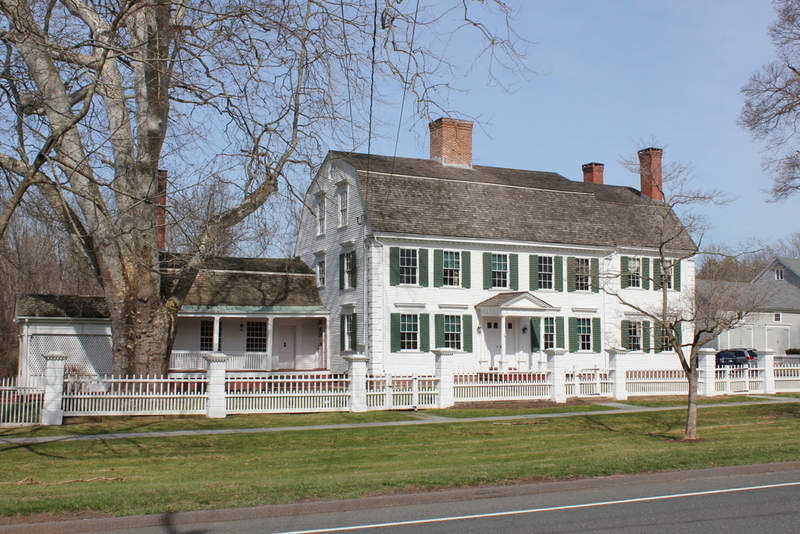 It was originally the home of David Tod, who was born in Scotland but came to Suffield in the mid-1700s. Here, he married Suffield native Rachel Kent in 1773, and at some point afterward the couple moved into this house, at the corner of present-day South Main Street and South Street. Two of their children, George and John, would go on to have prominent careers as lawyers, politicians, and judges. They both attended Yale, but after graduating they did not remain in Connecticut for very long. Like so many others at the turn of the 19th century, they looked west for opportunity, with George settling in Ohio and John in western Pennsylvania. George established a successful law practice in the Youngstown, Ohio area, and he also served in the state legislature before becoming an associate justice on the Ohio Supreme Court in 1806. Two years later, he took on a young apprentice, 14-year-old Jesse Root Grant, who later became the father of Ulysses S. Grant. George’s term on the court ended in 1810, but he subsequently served as a state legislator and a judge, as well as a lieutenant colonel in the War of 1812. His son, David, also became a prominent politician, serving as the governor of Ohio from 1862 to 1864. In the meantime, George’s younger brother John had a very similar career in Bedford, Pennsylvania. He served in the state legislature, including as the state’s Speaker of the House, and he was subsequently elected to two terms in Congress, serving from 1821 until his resignation in 1824. Like his brother, he also became a judge, and was appointed to the state supreme court in 1827. By the time the first photo was taken, the house had been significantly remodeled since the Tod family lived here, including a new roof and additions on the sides. However, the photographer noted at the time that the new roof was similar to the original, and that the house had been “remodeled at a considerable expense.” Around 80 years later, the house had changed very little, and it stands as one of the many elegant 18th century homes in the center of Suffield.